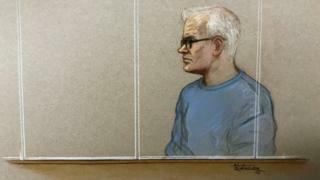 Image caption Michael Seed's defence lawyers say he is not the mystery Hatton Garden raider known as "Basil"
The last suspect in the Hatton Garden heist could have been visiting his mother or on a family holiday at the time of the raid, a court has heard. Michael Seed, 58, from Islington, is accused of being the alarm expert who played a key role in the £14m raid of the Hatton Garden safe deposit in 2015. Mr Seed, who denies the charges, said he was at home at the time of the raid, but evidence proved he had not used the internet for 10 days over the period. He said he could have been on holiday. He told jurors at Woolwich Crown Court he regularly visits his mother, who is in her 90s, at her home in Cambridge and meets up with his brother at his house in Forest Gate, east London. Asked about his possible whereabouts during the burglary of the Hatton Garden Safe Deposit company, he said: "I could have been at my mother's house, I could have been on holiday (in Portugal)." He added: "We go on a kind of family holiday twice a year in Cornwall ... we could have been there." Mr Seed also denies being the mysterious "Basil", who carried out a £1m burglary at Bond Street jewellery store Chatila with some of his fellow Hatton Garden raiders five years earlier, the court heard. He said he knew convicted Hatton Garden burglars Brian Reader, 79, and John "Kenny" Collins, 78, as small-time jewellery dealers from the diamond district, and once visited the house of their 63-year-old accomplice Daniel Jones to buy a mountain bike. Mr Seed was arrested on 27 March last year after police raided his one-bedroom flat in Islington, north London, finding jewellery and gold valued by auctioneers at £143,000. Reader, Collins, Jones, and Carl Wood, 61, have been convicted of conspiring to carry out the burglary in Hatton Garden along with Terry Perkins, who died last year. Mr Seed denies two charges of conspiracy to commit burglary and one charge of conspiracy to convert or transfer criminal property.